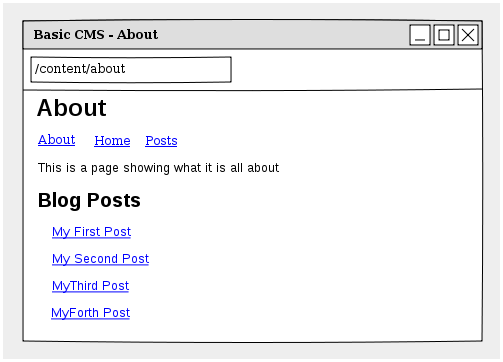 Pages: HTML content accessed at, for example /page/home, /page/about, etc. Posts: Blog posts accessed as /blog/2012/10/23/my-blog-post. The auto routing integration will automatically create and update the routes (effectively the URLs with which you can access the content) for the page and post content documents. In addition each page content document will double up as a menu item. There exists a bundle called SimpleCmsBundle which provides a similar solution to the one proposed in this tutorial. It combines the route, menu and content into a single document and uses a custom router. The approach taken in this tutorial will combine only the menu and content into a single document, the routes will be managed automatically and the native CMF DynamicRouter will be used.